Ettersom prosjektet Svestad Undervannspark er godt underveis passer det greit med et innlegg om mitt besøk ved undervannsparken i Mexico som vi er så inspirert av. Endelig har jeg fått muligheten til å dykke på undervannsparken som har gitt oss mye inntrykk av hva skulpturer under vann kan gjøre for det marine økosystem og dykkekulturen i nærområdet. I Mexico trengte de et rehabiliterende system for å styrke økosystemet etter orkaner. Det har vist seg at dette har blitt et eget populært dykkemål hvor de balanserer trafikken mellom naturlige rev og skulpturer for å bevare mest mulig. Alle skulpturene vi svømte ved var overgrodd av planter mens fisk og annet makroliv samlet/gjemte seg rundt formasjonene. I tillegg har skulpturene forskjellige karakteristikker som gjør det til et artig dykk. Etter blant annet disse observasjonene tar jeg med meg hjem ekstase over hva som kan skje i Oslofjorden for vårt trengende økosystem. In 2009 the first steps of a monumental underwater sculptural museum were formed in the waters surrounding Cancun, Isla Mujeres and Punta Nizuc. 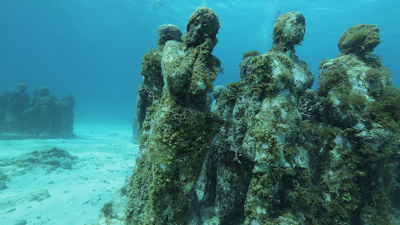 The project founded by Jaime Gonzalez Cano of The National Marine Park, Roberto Diaz of The Cancun Nautical Association and Jason deCaires Taylor, now consists of over 400 permanent life-size sculptures, one of the largest and most ambitious underwater artificial attractions in the world. The Museum aiming to demonstrate the interaction between art and environmental science hopes to form a complex reef structure for marine life to colonise and inhabit. 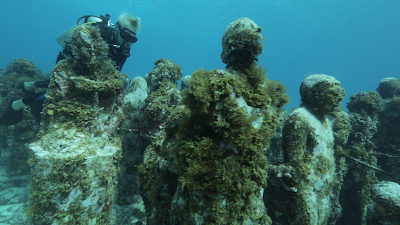 The main goal of English artist Jason Decaires Taylor’s work is conservation. Each of the more than 400 life sized sculptures are made from ph neutral clay in order to promote the growth of coral reef and marine life with the total installation occupying an area of over 150sq metres and weighing over 120 tons. The museum is located a short distance from the famous Manchones reef. As the museum grows and marine life forms, the aim is to give Cancun’s reef areas a much needed rest so they can recuperate from hurricane damage. The Cancun Marine Park is one of the most visited stretches of water in the world with over 750,000 visitors each year, placing immense pressure on its resources. 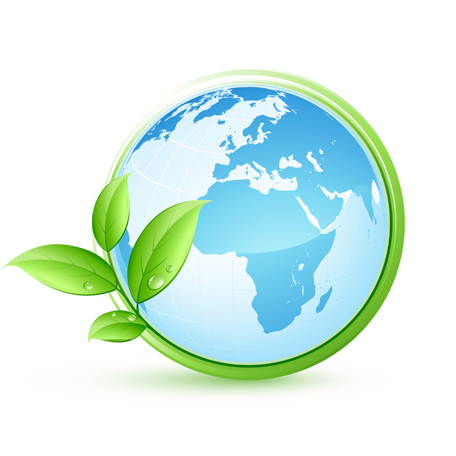 The location of the sculptures will promote the recovery of the natural reefs, relieving pressure on them by drawing visitors away.